The swatch (from yesterday has grown. It might even be uglier than it was yesterday. I keep telling my brain to shut up about the aesthetic value (or lack thereof) of the swatch. There is no point in getting attached to how it looks at this point in the game, since when it's all over it'll look nothing like this (hopefully it will look like a handmade bag that you would be happy to carry on your arm. We'll see.) All I know is that I have to knit it BIG so I have lots of "it" to play with once it's fulled to within a half inch of its life. That's the part I can't wait to see -- the post-fulling. 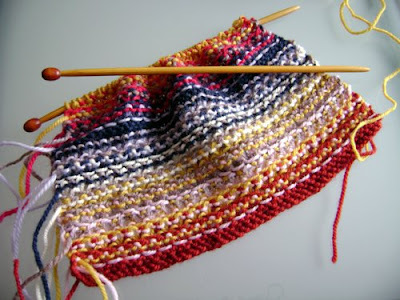 I want all those crazy slip-stitch garter stripe ridges to meld into each other until the finished fabric looks like a tangled, tweedy mess, and just thinking of it is exciting. Now, it's been a long time since I've messed around with fulling garter stitched fabric, and I just hope it works as well as I remember. I can't see why it wouldn't, really. All I know is that whatever this swatch comes out looking like, either pre- or post-fulling, both my brain and I will make do with what we're given. Yes, we are throwing caution to the winds and knitting A Something that might turn out to be Nothing Like We Pictured It Would Be. This is half the fun, right? The other half of the fun is the fact that we're using up the bits of yarn that aren't large enough to do anything else with, meaning we're going to have to repopulate the stash with new utility yarn. I think we can handle that. I think it looks like fun! I can't wait to see what happens when you full it. January 18, 2009 at 3:11 p.m. I don't think it's ugly, but it is interesting looking! January 19, 2009 at 12:52 a.m.
Hi, came across your blog on Ravelry (comment train) you have some lovely things on here, really enjoyed reading your blog. January 19, 2009 at 11:33 a.m.